Let there be light: An artificial metalloenzyme (blue) penetrates a mammalian cell, where it accelerates the release of a hormone (blue to red spheres). 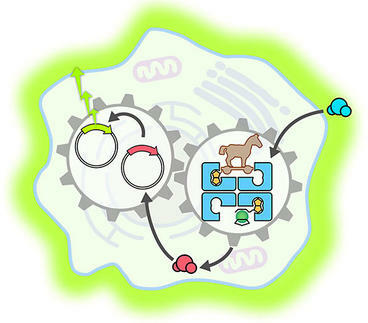 This activates a gene switch (circles with arrowheads), which then leads to the production of a fluorescent indicator protein (light green glow around the cell). 24-May-2018: Complex reaction cascades can be triggered in artificial molecular systems: Swiss scientists have constructed an enzyme than can penetrate a mammalian cell and accelerate the release of a hormone. This then activates a gene switch that triggers the creation of a fluorescent protein. The findings were reported by researchers from the NCCR Molecular Systems Engineering, led by the University of Basel and ETH Zurich. Nature relies on enzymes to accelerate energy-intensive biochemical reactions that are necessary for the preservation of life. However, natural enzymes are not all equally suited for all reaction types. Artificially created catalysts are much more versatile, as they can promote many more chemical synthesis processes. There is therefore great potential in introducing artificial catalysts into living cells and organs in order to modify cell functions on a genetic level or to create a drug from a harmless precursor in the cell itself. However, such catalysts often work only under strictly controlled conditions that are almost impossible to achieve in living cells. To overcome this restriction, researchers from the Universities of Basel (Professor Thomas Ward) and Geneva (Professor Stefan Matile) and from ETH Zurich (Professor Martin Fussenegger) developed a small-molecule catalyst that can control a gene switch. If this switch is activated, the desired cell function is triggered. For the current study, the researchers produced a metalloenzyme – a biocompatible protein in which a catalytically active metal fragment (in this case ruthenium) is incorporated. With this method, they succeeded for the first time in developing an artificial metalloenzyme that was able to penetrate a mammalian cell. Once in the cell, the metalloenzyme – like a Trojan horse – deployed its catalytic function and accelerated the production of a particular thyroid hormone. This hormone then activated a synthetic gene switch that led to the creation of a fluorescent protein called luciferase. The study, published in Nature Communications, proves the feasibility of an innovative approach that targets the development of cell functions and aims to complement traditional biochemical processes. The work is a good example of the opportunities offered by the combination of synthetic biology and organometallic chemistry for the control of cell functions in living organisms.